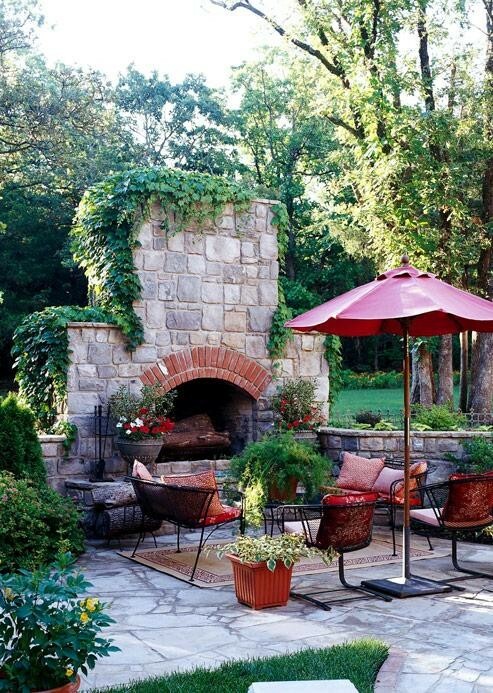 The landscape design for my client and BFF, Maureen was to include an outdoor fireplace. It was a little bit of a tough sell, as they were just fine with a fire pit. So, I gathered some inspiration photos to try and convince them that a fireplace would have more presence than a fire pit. This was the photo that won them over. Probably because it included a pergola, which was also part of the landscape design. 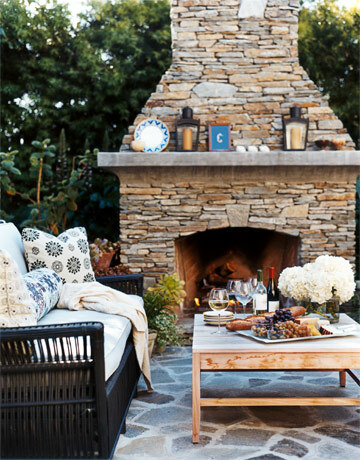 I like how an outdoor fireplace provides the focal point for an outdoor living room like this one, complete with sofa and coffee table. This photo was what influenced my plan. Gravel area and adirondack chairs. We decided not to build the fireplace from scratch though. I mean, how bad could a pre-fab one be? So, this is the fireplace that they ordered. From the picture, it looks pretty good! We crossed our fingers and hoped for the best, knowing that we could always "doctor it up." It took weeks for it to be delivered. In the meantime, blue painter's tape outlined the dimension and placement of the fireplace, should it ever arrive. It finally showed up yesterday, and it was a little bit of a disappointment because the body looked like sand and the stone looked plastic. No worries though, we can paint it! The body was painted the same color as the house. The faux stone was "fauxed" to look like slate. The landscape project is almost complete. The final touches are being added, just in time for the bridal shower on Saturday. Here is a sneak peek! Stay tuned for the final reveal, including lots of before and work-in-progress photos. I'm even planning a tablescape! Hallo!wow!Ich bin begeistert von deinen Feuerstelle...ich möchte auch eine in meine Haus in Brasilien machen.Schööön!Schöne donnerstag.Bussi.Lu. I am sure after seeing all these incredible pictures she needed no more convincing and it looks like you found the perfect spot!! I cannot wait to see it, know its going to be exquisite! I am so happy you did this because part of our multi stage plan for our own landscaping does include one too and this post was really helpful. Thanks, can't wait till the final reveal! Not fair, just a peek! It is going to be gorgeous if you are involved in the least bit. Can't wait! 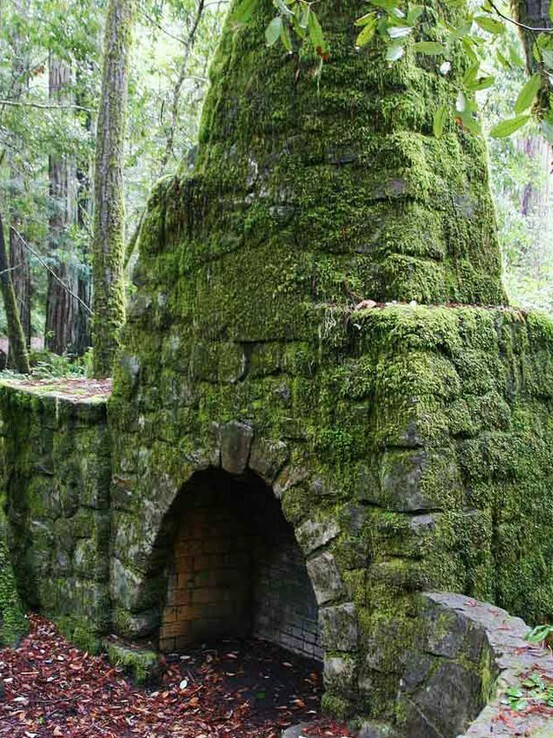 I am so dreaming of the moss covered fireplace. Just beautiful. Oh, and you are a big tease! : ) I can't wait to see I you fixed up the fireplace. 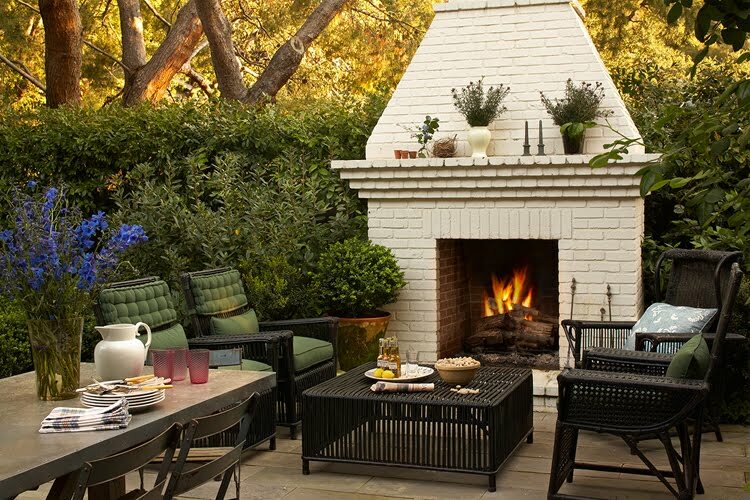 I am just swooning at the collection of outdoor fireplaces. Can't wait to see the finished project. Wow, you have been busy but very productive. No question in my mind that if you are doing this project it is all gorgeous. Can't wait to see the new garden. I know it's just going to be gorgeous! I can't wait to see the final results. 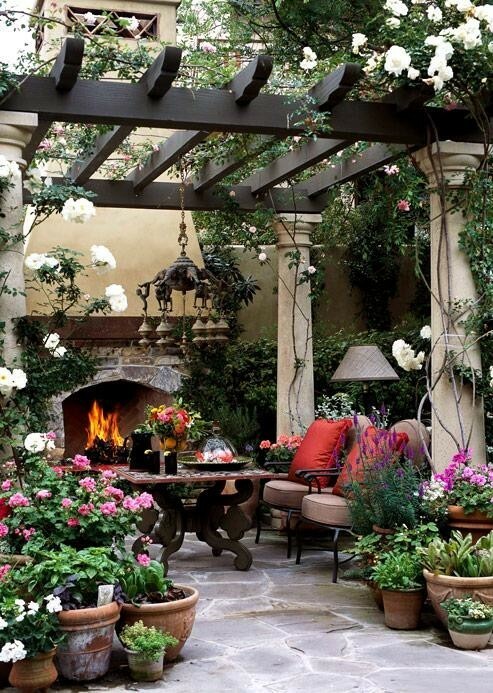 Love the first fireplace picture and the one with the pergola. 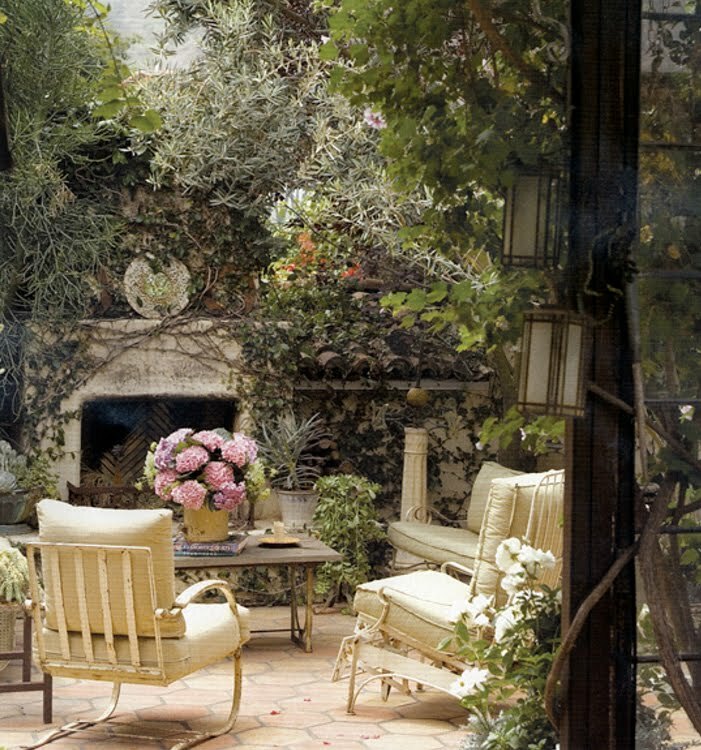 I like the fact that it is an outdoor room, with chandelier and the pots are all so wonderful with the overgrown plants. I aspire to make my potted garden look like that! Good luck on the final outcome, can't wait to see it. la belleza de los detalles decorativos y la presencia de las chimeneas ,hacen de estos exteriores unos lugares de confort y relax inigualables!!!!!!! 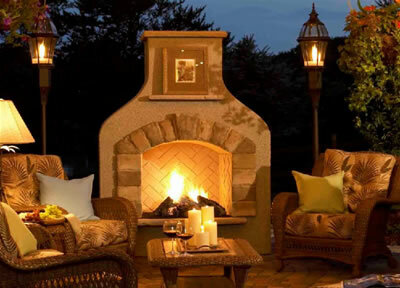 I need an outdoor fireplace. Such beautiful images. I am crazy about the first, moss-covered one. Is it possible to moss-up Maureen's new one? I also love the one with the vines growing all over it; very Grey Gardens. I am sure whatever you do will be fabulous, as usual. Each photo took my breath away...how wonderful to be so blessed to have such beautiful outdoor spaces to enjoy! Thank you so much for sharing them with us, Delores. I can't wait to see the final reveal on Maureen's. I am SOOOOO glad I signed up to get email alerts to your postings, otherwise I might have missed this. 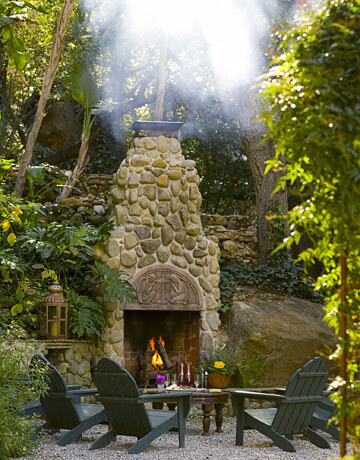 Oh yes - An Outdoor Fireplace is "soooo it" ;D Talk about the pièce de ré·sis·tance. I have loved visiting the house and seeing the project come together--you guys amaze me!! So Gorgeous. and your Blog & Photos (your Vignettes!) tell the Story just like the Reader was there through the process....in fact, the Photos you post are the exact Snapshots in my mind haha! Pretty Cool, Delores!! can't wait to see your client's reveal! so exciting, and good for you for all the great inspiration!! We have wanted an outdoor fireplace for a while now. So much inspiration here. We can't wait to see how this one turns out. Those are really all the rage in our landscape business right now. Sure love the way they extend the time spent outdoors. Especially here in Oregon, were it can be chilly at night! Outdoor fireplaces really do make it feel like a room and I wanted to jump into so many of the pictures you posted and sit awhile. I'll have to start planning mine...can't wait to your reveal. Wow! I wish I'd put in an outdoor fireplace! Great research, and I love your final design. I can't wait to see the final product after the plasterer takes care of the sand look. Keep us posted!